BioResponse DIM acts to overcome the extreme insolubility of pure DIM and makes DIM absorbable from the human digestive tract. The absorption-enhancing formulation uses the BioResponse Phytosorb® delivery system which is necessary for adequate absorption of DIM. Once absorbed, DIM from BioResponse DIM acts to support a favorable metabolism of estrogen. BioResponse DIM® contains pure DIM, microencapsulated in particles complexed with a vitamin E derivative and phospholipids promoting DIM absorption from our intestinal track. Microencapsulation of DIM produces a dry powder complex with proven absorption. BioResponse DIM use supports metabolism and augments our dietary intake of cruciferous vegetables. A daily intake of 3-5 servings of vegetables, especially cruciferous vegetables, is recommended by the USDA “Dietary Guidelines for Americans”. BioResponse DIM provides a source of indole which is shelf-stable. 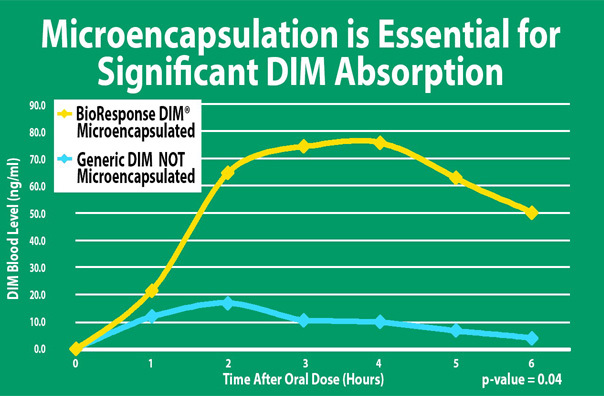 BioResponse DIM remains stable following mixture, encapsulation or tableting with other dietary ingredients. Regular use of BioResponse DIM serves to augment daily intake of cruciferous vegetables, contributing to health promotion. How is BioResponse DIM unique? Regular use of BioResponse DIM supports a more favorable metabolism of estrogen. Unlike I3C (Indole-3-carbinol), an unstable precursor, DIM released from BioResponse DIM requires no action by stomach acid to be active as a support for metabolism. BioResponse DIM supports the production of 2 hydroxyestrone and 2-methoxyestrone, key metabolites in men and women. BioResponse DIM provides proven bioavailability of highly insoluble DIM through action of its proprietary dosage form and delivery system.